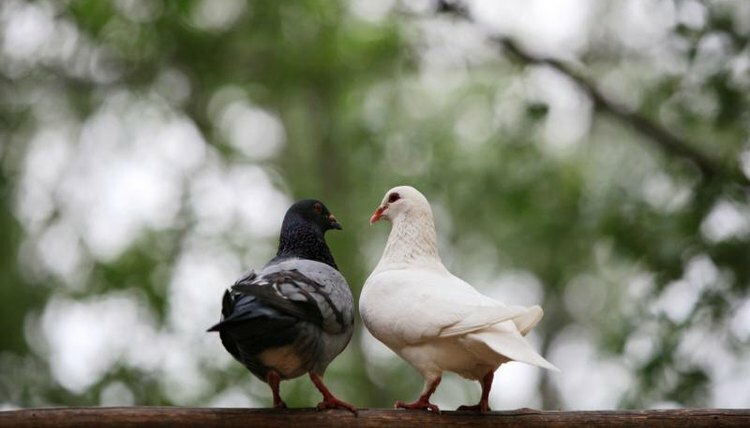 Easily trained, pigeons make soft, pleasing sounds. Baby pigeons, or squab, are strange-looking creatures during their first few days of life. They have large closed eyes and long thin necks. Born without feathers, they're covered with down. Feed orphaned newborn pigeons every two to three hours. They don't need to be fed in the first 12 hours after hatching. They'll sleep after the hard job of breaking out of their shells. Line a large ventilated box with several layers of newspaper and place it in a warm, draft-free spot. Keep the temperature in the box at about 90 degrees Fahrenheit until the newborn pigeons are 2 weeks old. A red 40 watt bulb or a hot-water bottle refilled every 2 hours and placed under the layers of newspaper will accomplish this. Place a thermometer in the box to avoid overheating the newborns. Keep the babies warm at all times; a chill can be fatal. Begin feeding your newborns when they are about 12 hours old. Canary baby bird formula has the nutritional value your pigeons require. Mix the powdered formula with sterile bottled water until it's the consistency of applesauce, following the manufacturer's directions. Warm it in a bowl of hot water if necessary. Don't heat the formula in a microwave, as hot spots can burn the babies. Discard any uneaten prepared formula. Give the prepared room temperature formula to the newborns every two to three hours using a needleless syringe or a feeding tube. Open a pigeon's mouth gently and look for a tiny hole inside. Don't get food in this hole, as it's an air passage. Place the feeding device past this hole and feed him slowly until his crop is slightly rounded, but not tight. Allow the crop to empty completely between feedings. When your young pigeons are 21 days old, put little flat dishes of whole grains and seeds mixed with a small amount of grit on the floor of their cage. They will begin pecking at the grains in a few days. Always supply fresh water in cage dishes that are at least 0.75 inches deep. Decrease the formula feedings gradually as the pigeons increase the amount of grains they consume. Your young squab are fully weaned at around 28 days old. Move your three-week-old squab to a large cage or outdoor aviary. Almost fully feathered, they require an hour or two out of their cage daily to strengthen their flight muscles. Release rescued pigeons only after you're sure they're strong flyers and can consume enough food on their own.